Ross Guthrie admits Civil Service Strollers taught Edinburgh University a footballing lesson as they dismantled the Students en route to a comfortable 5-0 victory. 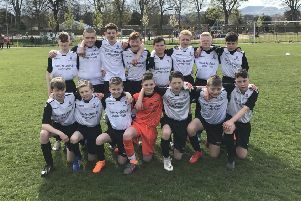 Gary Jardine’s side boosted their prospects of a top-four finish in emphatic style at Christie Gillies Park to ensure they leapfrogged Spartans in the Lowland League. Former Edinburgh City midfielder Guthrie got the ball rolling after 15 minutes when he capitalised on a slack clearance from the Uni defence, sliding the ball past the goalkeeper and into an unguarded net. University shot-stopper Matthew Mackie was left red-faced and fumbling the ball into his own net following some good wing play by David Churchill. Andrew Mair stretched Civil’s advantage further in the 77th minute when he headed home from a corner before utility man Churchill made it four in the closing stages. There was still time for new signing Kerr Allan to mark his debut with a goal in the final minute of regulation time to increase Strollers’ unbeaten run to eight games. For Dorian Ogunro’s men, their wait for a first league win in more than three months goes on. “We were clinical when we had to be and I’m delighted with the result,” said 28-year-old Guthrie. “They maybe caught us at the wrong time because we’ve been on a brilliant run of late and the boys have been champing at the bit to keep the good form going. “With our game being called off last week, Gary had us in for a tough training session and the boys were looking forward to this match. “There’s a tremendous atmosphere in the changing-room just now and we’ve been scoring goals from all areas of the pitch. We’ve got a lot of quality in the team and that has perhaps gone under the radar a bit. “The aim was to build on what we achieved last season and the position we find ourselves in now is really promising going into the final run of games. “Realistically for us to finish in the top-six would be a massive achievement, so anything above that is a bonus. Meanwhile, Stirling University heaped further woes on relegation battlers Whitehill Welfare, who succumbed to a 2-0 defeat at Forthbank Stadium. Ian Little’s side appeared to be on course to claim a share of the spoils, but second-half goals from Aidan Ferris and Blair Lyons ensured the Students collected maximum points. Whitehill began on the front-foot with recent Blackburn United recruit Jordan Bain drawing a smart save from goalkeeper Kevin Walker in the eighth minute. A series of corners almost resulted in the opening goal for the visitors, but Lewis Hunter headed a net-bound effort off the line. Aidan Ferris was then denied by Whitehill keeper Paul Grant who got down to block the former BSC frontman’s low strike after 36 minutes. The deadlock was broken in the 65th minute when Ferris forced the ball into the net from close range after Angus Mailer’s cross wasn’t dealt with by the visiting defence. Stirling doubled their lead nine minutes later. Grant again got a strong hand to Ferris’ shot, but the ball broke to midfielder Blair Lyons who cut inside before firing a low shot into the bottom right-hand corner. Whitehill full-back Kevin Keane struck the crossbar with a free-kick late on from the edge of the box.